Candlewick Press has a wonderful series of books with an adorable character named Oscar who learns all about the world around him from his animal, bird, and insect friends. Some books are enjoyable because of their storyline and illustrations and others are adored because they are instant classics, and still others are well-loved because of all three. The Oscar series of books falls into the third category in my opinion. With detailed digital illustrations, Geoff Waring creates a natural world full of animals, leaves, flowers, and insects small children will love to learn about. Waring beautifully meshes Oscar’s character with a science educational adventure in each book. 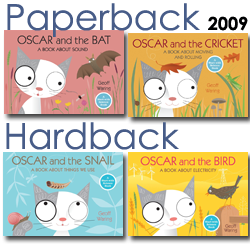 In the 2009 releases (2 in paperback and 2 in hardback) Oscar learns about things we use from his friend, the Snail, he learns about sound from Bat, moving and rolling from Cricket, and electricity from Bird. And at the end of each book, Waring places a “thinking about” section that encapsulates the ideas that have presented in the book. The Oscar series of books comprises effective thinking books for toddlers and young children. Beautifully designed pictures coupled with an educational lesson always rates high on my list.